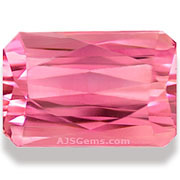 For lovers of pink gems, there is no gemstone variety which provides as many choices as pink tourmaline. 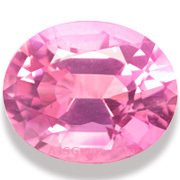 The range of pink hues seems limitless; indeed tourmaline is truly an education in pink and all its variations. While pink gems have been an important fashion trend in recent years, the fascination with pink tourmaline goes back to the earliest days of tourmaline mining in California. The Empress Dowager Tzu-hsi (1835-1908), the last Empress of China, was obsessed with pink tourmaline, and bought virtually the entire production of gem quality material from the mines in San Diego County during the last years of her life. Working through Tiffany & Co., the Imperial Chinese government imported more than 120 tons of gem quality tourmaline rough from California between 1902 and 1910, mainly for carvings. When the empress died in 1908, she was laid to rest with her head resting on a carved pink tourmaline pillow. When the Imperial Chinese government collapsed in 1912, it also meant the end of the tourmaline boom in the USA. But with the marketing support of Tiffany & Co. and their chief gemologist, George Frederick Kunz, tourmaline eventually became established as one of the leading semi-precious gems. 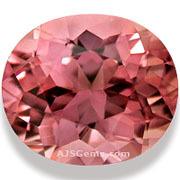 In addition to its wide range of hues, one of the attractions of pink tourmaline is that it can be found in large sizes. Fine quality stones over 5 carats are common, and 10 carat pieces can be found. 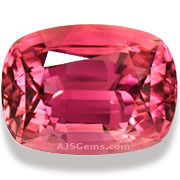 Most of the high quality material is eye clean, though the magenta-colored rubellite tends to have significant inclusions. 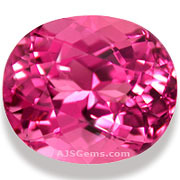 Usually pink tourmaline is untreated, but some stones may be heated at low temperature to lighten the color. After the American tourmaline mines were mainly worked out, Brazil became the largest producer of high quality tourmaline. 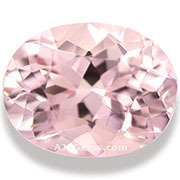 Today the focus has shifted to Africa, where fine pinks have been found in Nigeria in West Africa and Mozambique in East Africa. Chrome tourmaline in limited quantities has been mined in Tanzania while some interesting yellow tourmaline has been found in Zambia. The other tourmaline producer of some importance is Afghanistan, which is known especially for its blue green tourmaline. This month we feature fine gems from Burma (Myanmar). Though we see very few new stones from Burma, we have acquired a number of excellent pieces over the years. The Burma origin carries a premium in the market, and usually with good reason -- a fine Burma gem has few rivals. Rubies from Burma are generally regarded as the finest in the world. They are famed for their pure red color -- a color referred to as pigeon's blood -- and a unique fluorescent quality. This 3 carat trillion displays top color with intense saturation. 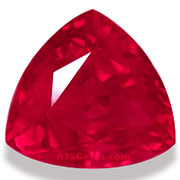 Beautifully fashioned in a trillion cut, this is a gorgeous example of fine Burma ruby. Certified by GemResearch Swisslab (GRS). 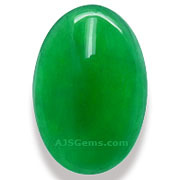 Jadeite is found in several places in the world, but the finest jadeite -- known as Imperial Jade -- comes only from Burma. Imperial jade is a deep emerald green with excellent translucency and should be completely untreated (known as "Type-A Jade"). This 6.64 ct Imperial Jade cabochon has been certified by The Gem and Jewelry Institute of Thailand (GIT), one of the leading authorities in the world on Burmese jade. 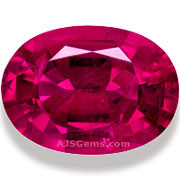 Until some outstanding spinel was discovered in Mahenge, Tanzania, Burma was the source of the finest spinel, especially reds and pinks. 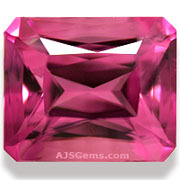 This 3.21 ct pink red spinel displays nice crystal with a saturated color. Well cut in an interesting fancy shape, this fine gem will make a gorgeous ring or pendant. Completed untreated and graded "almost loupe clean." 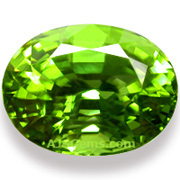 The finest peridot in the world comes from 2 locations: Burma and Pakistan. The best of the Burmese material tends to a bright apple green while the Pakistani stones tend to be darker in tone. This 7.04 ct oval is a dazzling stone. We've graded this gems as "loupe clean," with no blemishes or inclusions. Though Burma is best known for ruby and jadeite, many gemstone varieties are found there, though few have been mined commercially. 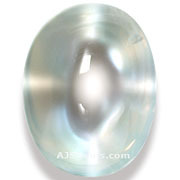 The fine Burmese moonstone is noted for its excellent translucency and unique irridescence. Just in case we needed another reminder that transporting valuable gems is risky, an armed gang took less than 5 minutes to execute a well-planned heist at Brussels airport on February 18. The thieves took an estimated $50 million in rough and polished diamonds from the hold of a passenger plane destined for Zurich, shortly after the gems had been delivered by a Brinks security truck. The thieves, wearing police uniforms, entered the airport in 2 vehicles through a hole they had made in a security fence. Though the Kimberley certificate numbers for the rough diamond lots have already been circulated, the likelihood of recovering the diamonds is low. Gemfields PLC, one of the world's largest mining companies for colored gems, has predicted that the market for colored gems will quintuple from $2 billion a year to $10 billion over the next 10 years. Gemfields is best known for mining Zambian emeralds, and the recent acquisition of luxury jewelry brand Faberge. They have also begun ruby mining in Mozambique. While it is true that interest in colored stones has never been stronger, the size of the market is currently limited by supply rather than demand. There are really 2 steps to getting an appraisal of your gems. The first step is to out what you have -- Is it natural? What gem variety? Where is it from? Has it been treated? The second step is to get an appraisal of its value in the current market. It's very important to do these in the right order, since you need to know exactly what you have before you can inquire into its value. Unfortunately it's not one stop shopping to accomplish this. Usually you need to take your gems to a gemological lab for identification, then to a professional appraiser for a valuation. We don't have a retail shop here in Thailand, but we do show gems by appointment at our office in the heart of the gems district in Bangkok. Please contact us to arrange an appointment. You can review our collection on our website first, and indeed you can purchase fine gems at Bangkok direct prices without ever leaving home.